This customer wanted to get rid of their antiquated blue mildewed tile and tub and change it to something more convenient walk in shower. They love that they now have a seat in their shower for safety concerns. Customer had an older tub with fiberglass surround that was leaking and she was very concerned with safety due to falling. We took out the tub and put in a convenient walk in shower with grab bars for safety. Gave the shower area a complete makeover with the bonus of making it virtually maintenance free. This old farmhouse in Bethel was ready for an update! We met with the resident to help them find the perfect solution- the owner really liked that our siding also had insulation attached, providing the older building some much needed efficiency. When she saw our Eurostone option, she fell in love with it. This maintenance free option has the same look and feel of real stone! Tina leslie was so good. Very thorough and informative . Get the home you've always wanted from the inside out! We specialize in all home improvement projects from exterior repairs to interior remodeling. Call us to see how we can help you today! 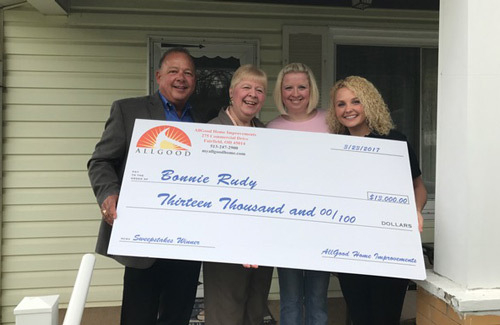 Here at AllGood Home Improvements, we’re dedicated to providing you with the best products and customer service while saving you money on your home repairs. Along with our Pittsburgh location, we have over 20 years of experience providing window, roofing, siding, and remodeling services to our happy customers. We are proud of our professional standards and we work hard to cultivate a reputation to match – your satisfaction is our top priority! Our technicians are highly skilled and knowledgeable about their craft. We listen to your input and make intelligent suggestions, bringing your ideas to fruition in the most efficient way possible. And because of our friendly attitudes, you will always feel more than welcome to ask questions or voice concerns! Most importantly, when we form a relationship with you, it’s for life. We encourage you to give us a call every once in a while for maintenance or for help with a new goal. Start living in the house you wish you owned today! Looking to Get Started on Improvements or Repairs? The time is right for your roofing, siding, window, or remodeling wishes to come true. AllGood Home Improvements offers Free Estimates for all of our services, scheduled at a time convenient for you. Contact us online or call us at 1-513-247-2900 to schedule your free roofing or bathroom remodeling cost quote today! We provide our expertise to residents of Fairfield, Hamilton, West Chester and nearby areas. Design the bathroom you've always wanted! We specialize in designing and installing the bathroom of your dreams! On top of our primary services, AllGood Home Improvements can help with your bathroom remodeling needs. Remodeling is the perfect way to add value and comfort to your home! To learn more about these offerings, please feel free to contact us and ask! Our technicians are always here to answer any of your questions. From siding to roofing we do it all! No matter what exterior services your home needs, AllGood Home Improvements can do it all and more to give you the home you always desired. Windows: Windows add light and aesthetic appeal to any home. And, when installed properly, tight-fitting windows save you money on your utility bills by increasing energy efficiency! Siding: AllGood Home Improvements specializes in vinyl siding. This durable yet flexible material comes in an enormous variety of colors and finishes, so you can acquire any look you desire – for less money and much easier maintenance! Roofing: Your roof is easily one of the most important features of your home – you wouldn’t have much shelter without it! We can install a new or replacement roof or provide roof maintenance services. Gutters: Gutters are the first line of defense your house has against water damage. A properly installed and functioning gutter and downspout system is a must-have for any home. Let us make sure your home is protected with our expert gutter services! Our business promises to give you the best, and these products deliver! Get Your Free Ohio Home Improvement Cost Quote Today! With competitive pricing and more options than ever, there are no more reasons to delay. Get started on the projects you’ve always wanted to complete. You’re sure to love the outcome when you’re involved in the design! AllGood Home Improvements is locally owned and operated with years of experience in the area. As a family company, we cherish the relationships we build with our customers. We’re happy to report that we see a large number of our customers again to complete new projects. Our industry expertise and customer service skills make us your best choice for all things home improvement! Contact us today to schedule your appointment! We offer Free Estimates for all of our services to residents of the following cities and areas nearby: Cincinnati, Dayton, West Chester, Loveland, Middletown, Fairfield, Springboro, Covington, Florence, Hamilton.